WBALTV: Two men who police said robbed a pub in Woodlawn may not have expected it to be full of police officers. The armed suspects walked in to Monaghan’s Pub a little before 5:30 p.m. Tuesday. It turns out that the pub was hosting a police officer’s retirement party with dozens of off-duty officers in attendance. “I’m sure that they weren’t planning on there being a large room filled with police officers,” Baltimore County police Officer Jennifer Peach said. Investigators said two men entered the take-out portion of the restaurant and held an employee up at gunpoint. Investigators said the suspects had just left the restaurant, but they didn’t get far before the off-duty officers at the party ran out and took them into custody. Police didn’t say how much cash Joseph McInnis III, 21, and Tyree McCoy, 22, initially got away with, but they said none of the employees, patrons or officers were injured. McCoy and McInnis are charged with armed robbery and possession of a handgun. 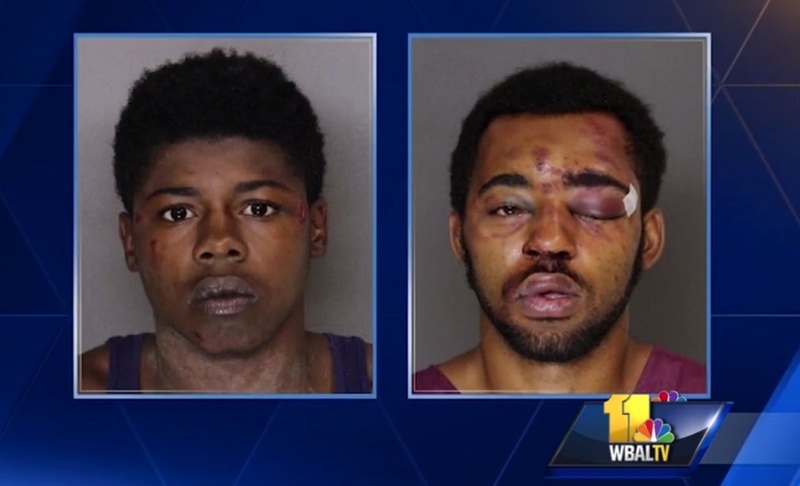 They are being held without bond at the Baltimore County Detention Center.